Lower dolpo to Jomsom Trek is wilderness and off the beaten isolated areas, opened in 1982 for all foreign visitors. The main highlighted of Lower Dolpo is the home of Shey Phoksundo Lake and Shey Phoksundo National Park. Lower dolpo trek located under the protected area and takes us to superb Phoksundo lake with beautiful flora and fauna. It is situated in the Karnali region and required a special permit from the government of Nepal. Lower dolpo / dolpa to Jomsom Trek is a very dry and unproductive area so the people lived here a very difficult life but they were very humble and friendliness with their smiling face. 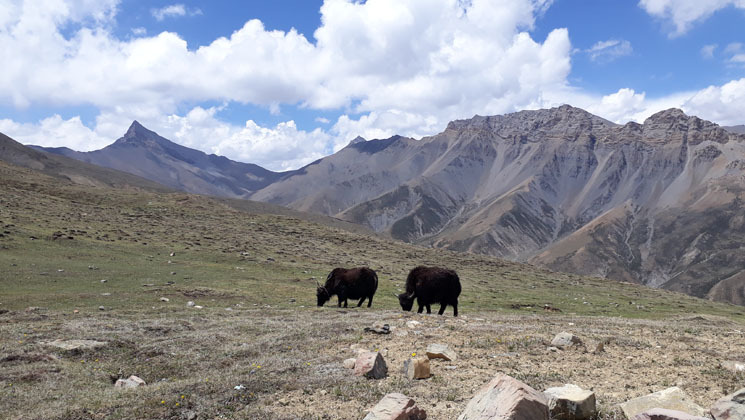 When trek in Dolpo is blended with Jomsom and the natural magnificence of Dhaulagiri, the trek undoubtedly becomes Nepal’s one of the most rewarding trekking trails. Dolpo to Jomsom trek combine with the sightseeing of Dhaulagiri Mountain Range holds brilliant scenery. The trek leads you through several unique villages of Dolpo to Niwar Peak High Camp all the way to Jomsom via Mo La Pass. Shey Phoksundo lake is the deepest lake of Nepal which is situated in this region. Since last few years, it is going very popular trekking of western Nepal. The trek is moderate to strenuous walk along the lower part of Dolpo. Beautiful Lakes, People lifestyle, Buddhist Monasteries, Tibetan plateau and the traditional culture are the main attraction of this route. The local inhabitants still earn their livelihood by trading commodities like salt, cotton, barley and rice in Tibet. Lower dolpo trek can be done in any time (except winter) throughout the year. It is a particular route is designed for world travelers who wish to hike in a more relaxed manner than take a look at this itinerary. However for travelers who wish to do quickly but are walking with limited time wise than ask us for tailor-made itinerary. Day 2 Lower Dolpo Restricted area trekking permit arrangements. We need your original passport with Nepal’s Visa to prepare Lower Dolpo restricted area permit. It takes some hours for official formalities to complete permits. Than we fix for meeting time each other. You will introduce with your guide. Your guide will brief details of this trek. Day 3Kathmandu to Nepal ganj city flight. Transfer to hotel. Fly from Kathmandu to Nepalganj (roughly about 1 hour by flight). And then overnight at Hotel. Fly from Nepalgunj to Jhupal by 35 minutes. As soon as you reach at Juphal, shopping and other entire things managements and after Lunch, start trek roughly about two hours to Dunai village then overnight at Tent Camp. We walk straight forward along the along the river side through some clusters of settlements. Today we have easy excursion day so we wlak roughly about 4 hours only. Tarakot is a typical authentic village the people have their own culture and traditions. Local people of here around speak a local dialect ‘Kaike’, which is spoken only in some clusters of this village and it is not understood by the people from any other villages. Villagers strictly follow their own social norms. Then we walk further to Mushi Khola where we stay overnights. Its interesting to congregate the diverse social lifestyles and the hardness of the people than the trail leads you to Kakkot village for the nigh stop. Since the route is not been in use by most of the trekkers it is still untouched and diverse in culture. Although, you can enjoy the fascinating views of the whole range of renowned Dhaulagiri. On top of that you can enjoy the gorgeous view of Putha Hiuchuli and as well as Dhaulagiri. Today we walk alot of ups and downs by the side of river. Few bushes are found on the route as almost complete Dolpa offers desert landscapes. The village is tiny and offers just a nice monastery there. Day 9 Terang to Mukot Gaon. The trek goes moderate slightly uphill, in some place the trail is straight. The trail is good enough for mules and horses. One has to take water for the trail as the does not exist water sources. Mukot is a nice village, which is one of the hidden valleys of Dolpo. Very few people have seen this village. Trek goes further walking over the tree less areas to Yak Kharka village which takes about 5 hours. Along the journey, you can see the great view of Dhaulagiri Mountains. After enjoying the best Dhaulagiri Himalayan scenery, you can proceed to Mula pass located around 18,312 ft above sea level. As it is high pass trek today, its tough day but i am sure that you can enjoy with nature always. After crossing the pass you will have night stop at a high pass camp at an elevation on 16,308 ft above sea level. Another most exciting day today is because of tough hike to cross over two passes. After a strenuous trek along the passes finally you come to stop for the day at Ghaldang Ghuldung. The trail goes through barren landscapes with slop hills. Water is not always possible. Day 15 Hidden Valley Rest Day to discover around . Today, we have rest day at hidden valley to explore different mountain like Dhaulagiri, Dhampus, and several small snow covered peaks. Day 16 Climb Dhampus peak if you are interested. Along the trail, there is a Dhampus Peak, so if you are interested or if you have a peak climbing permits, you can climb. Today the trek goes up to the Yak Kharka for our overnights. The trail is still challenging , so one should be very careful while walking (nearly for 15 to 20 minutes). The trail is made on the slope hill. Marpha is a famous place for apple garden and apple brandy. On the top of Marpha village, there is a monastery from where one can have the views of the village and the Gandaki river valley. Just above the monasteries are a chorten painted onto the cliff face and a number of small stone chortens on the ledges below. Marpha village is good to have a day hiking tour but as it has roadway it is not a good idea to trek because of dust. Day 19 Marpha to Jomsom Bazaar. Confirm the return flight to Pokhara. From Marpha it’s an easy walk towards North along Kali Gandaki river banks. Jomsom is a town located at an altitude of about 8,830 ft in Mustang District, Nepal. It spreads over both the banks of the Kali Gandaki River. Today you will have a morning flight from Jomsom to Pokhara and then to Kathmandu in a same day. During the flight, you will have almost best mountain flight to experience the complete Annapurna massive including the tallest Mountain Manaslu including holy Mountain Fishtail. On your arrival in Kathmandu, our guide or one of our representative will pick you up and takes you to the hotel. How much does Lower dolpo to Jomsom Trek cost? Hike to Lower dolpo to Jomsom trek is available now on USD 3,150 is standard trek price per person on double occupancy basis. But of course, the trip price will vary according to group size. For the deluxe and luxury trekking tour plan, we add 3-star category hotel deluxe air-conditioned room in Kathmandu (BB PLAN). AND WE ARE OPEN TO CUSTOMIZE YOUR TOUR AND PACKAGES PRICE AS PER YOUR REQUIREMENTS. International tour leaders are highly encouraged to get discount and attractive complimentary. Twin sharing tourist standard hotel accommodation in Kathmandu with breakfast plan. Meals : Breakfast, Lunch and Dinner each day during the trek days prepared by our expert cook. All the essentials camping and kitchen equipment. An experienced English speaking local trekking guide. Lower dolpo Special trekking permit issued by Immigration of Nepal. Annapurna conservation permits and their fees. Domestic flights: Kathmandu – Nepalgunj – Juphal. And from Jomsom – Pokhara trip with tax. Food / Salary / accommodation and medical or accidental insurance of all the trek staffs. Gokyo Treks and Expedition company kit bag. Lunch and Dinner during the staying in Kathmandu and Nepalgunj city. We can organize private Lower Dolpo to Jomsom Trek starting at any date that works for you. Please contact us for more information. Question: Do I need the experience to do Lower dolpo to Jomsom Trek? Answer: Actually for this kind of trekking is suitable for keen trekkers/walkers who are able to walk around 4 or 5 hours in a day, with a lightweight daypack. For this trekking, if you have about the little experience would be better. Question: What kind of accommodation can I expect on Lower Dolpo to Jomsom Trek? Answer: We provide you tourist standard accommodation in Kathmandu and Tented camping accommodation on trek routes. However we recommend you to take your own sleeping bags if you have one with you otherwise, you may rent it while you are in Kathmandu. Answer: During the tented camping trekking, our professional cook prepare a delicious range of mostly vegetarian such as Pasta, tuna bakes, noodles, potatoes, eggs, dhal bhat, bread, soups, fresh vegetables (variety depends on the season. Question: What opportunities will I have for a shower along Lower dolpo to Jomsom Trek? Answer: As you are in camping trekking, we provide you hot water bucket then you will take a bucket shower. Question: How do I get drinking water on dolpo Trekking? Answer: During the local lodges here will be more chances to charge the battery. We recommend you bring an extra pair for in case. Remember to bring your own adapters! Question: Is there any communication facilities on Lower dolpo to Jomsom Trek? Question: Can I use credit cards in Lower Dolpo Trek? And regarding the deposit, we prefer 25 % advance deposit of the total price of the trip in order to confirm your reservation before you arrive in Nepal. And the rest of the payment can be made after your arrival in Nepal. Question: Who will carry my luggage on express Lower dolpo to Jomsom Trek? Question: Do I need walking polls on Lower dolpo to Jomsom Trek? Ancient and isolated villages, Buddhist monasteries, Enthralling culture and tradition. Believed to be a inhabitants of Snow Leopard with many other wild animals.